Following a refit, Sheraton’s Sydney Hyde Park property treads the line between grandeur and comfort well. With a wealth of finely crafted boutique hotels right in the heart of Sydney, the type that tend to grace these pages, it can be easy to forget the big, grand properties that have occupied prime CBD real estate for decades. Now and then these behemoths put their hands up to remind us that they’re still here, undergoing expensive refits to reassert their elevated position over trendy newcomers; bigger is always better surely? Well it cost $50 million to update Sheraton on the Park (opened in 1994 when the first episode of Friends aired and the internet was but three years old) to the refined, contemporary feel it has today. My wife and I make our way to its grandiose entrance just over the road from St James station, to find ourselves in a towering lobby held aloft by colossal black marble pillars that could have been plucked from the Parthenon. Indeed, the newly coined Sheraton Grand Sydney Hyde Park reflects the hotel’s elevation to the chain’s ‘Grand’ collection of properties now that it’s revitalised its 558 rooms. With weekend bags instead of briefcases, we’re conspicuous as we head for the lifts. We’ve booked a vast Grand Executive Suite for a much reduced price with a last-minute deal through the hotel. 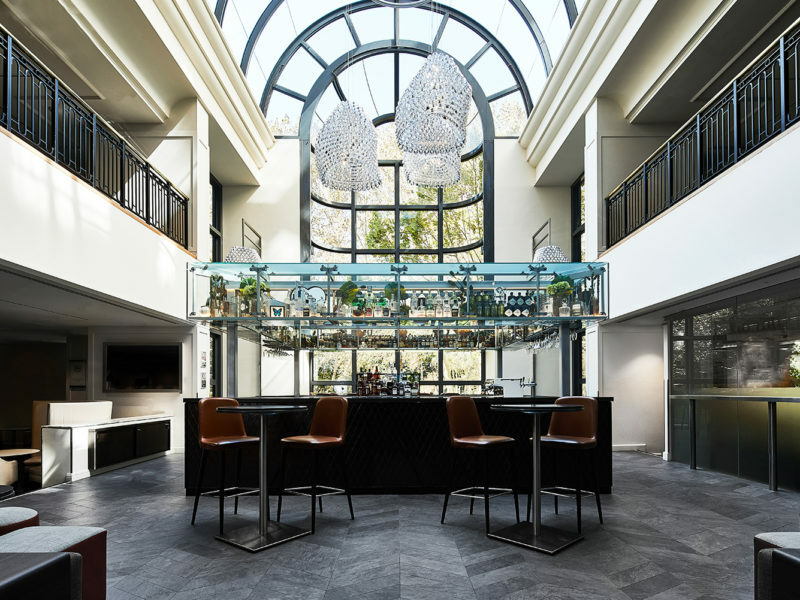 And if the lobby is all big and grand as you’d expect, the rooms have now been softened, retaining an air of requisite corporate sophistication in the greys and taupes used on walls and fabrics, but made more welcoming with the use of dark timbers and soft lighting. The lounge’s L-shaped grey fabric sofa is an inviting foil to the big Trumpian leather office chair and mirrored black desk opposite. There aren’t any whimsical or ironic elements here, and it’s welcome to have more of an emotionally blank canvas of a space to sink into – tired high-flyers must appreciate it too. An expansive marble bathroom completes the picture. And then there’s the view, out across Sydney’s answer to New York’s Central Park, the sandstone spires of St Mary’s Cathedral and on to the distant headlands, proving the city doesn’t have to reveal its World Heritage-listed harbour to impress. 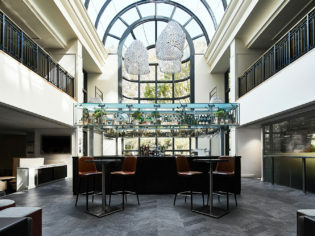 While the hotel’s Feast restaurant has a leafy aspect, it channels something of a cruise ship buffet; ideal for group parties wanting a convenient lunch in between meetings, but couples should order martinis at the airy Conservatory Bar and head to the likes of acclaimed Restaurant Hubert a few blocks away. We leave feeling like we’ve uncovered a new city secret: behind all the marble and past the suits buzzing about the lobby is a spacious, affordable CBD retreat; sometimes bigger is most certainly better. Such generous space in Sydney’s CBD with excellent views represents great value for money if you book last minute. The location can’t be beaten and who doesn’t love a rooftop spa complex? Feast restaurant isn’t going to appeal to anyone outside large groups and convenience-seeking business types.